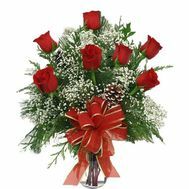 It's time for gifts and surprises, it's time to fulfill desires and realize dreams. Of course, you guessed it - it's time - New Year and Christmas. To give and receive gifts - what can be more wonderful! Perhaps, only the choice of New Year gifts can "win" in this competition. After all, think about everyone, feel his desire, understand what the face of a person will shine with a smile, when he receives a New Year gift from you - is this not the main pre-New Year's pleasure? Gifts for the New Year can be very diverse, ranging from plush toys and chocolate sets to collection wines and glamorous outfits. 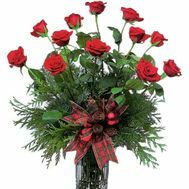 But in this line of various gifts not so long ago one more New Year's gift was added - it's a New Year's bouquet. 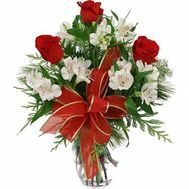 Usually bouquets are given for birthdays and for various important events. 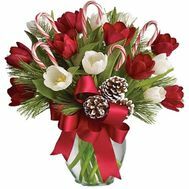 A bouquet for the New Year? Is not it strange? No, it's not strange. Such a gift is no less wonderful than all the others, long accustomed. Such a gift can add fabulousness to the entourage of New Year's Eve and become the main creator of the "same" New Year's mysterious mood. 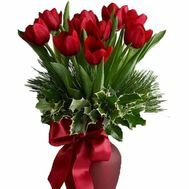 To give flowers for the New Year is a European tradition. 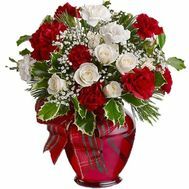 What makes New Year's bouquets different from ordinary ones? 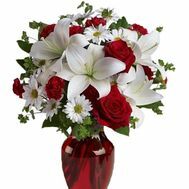 The fact that every New Year's bouquet is not just a beautiful combination of colors. 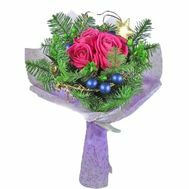 This combination of beautiful flowers with New Year's magic: Christmas toys, pine or spruce branches, cones and other festive decor. 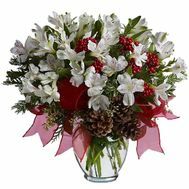 New Year's bouquet - an original gift for the New Year! 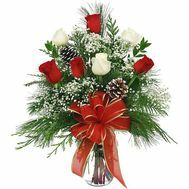 Take, for example, a bouquet of roses with sprigs of pine, giving a gentle aroma of needles and fresh. 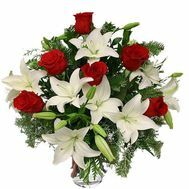 The fragrance of such a bouquet will please and will be remembered for a long time by the person who received the gift. 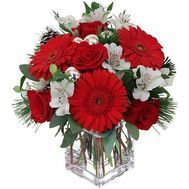 Or a bright, solemn bouquet, elegant as fireworks - a combination of orchids with peacock feathers and fir branches, decorated with New Year balls. 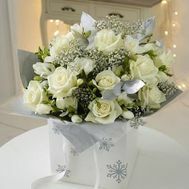 Or a gentle feminine bouquet of green orchids simply decorated with shiny New Year's tinsel. 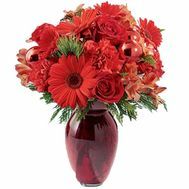 Options for New Year's bouquets there is a very, very much, for a different taste and color. 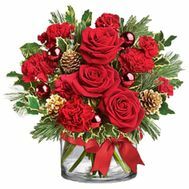 And any of these floristic masterpieces will present an amazing fairy tale and a magnificent New Year mood during the New Year holidays! 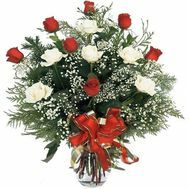 Choose and give New Year's bouquets to your family and friends and let their surprise and joy to your gift make you happy on New Year's holidays! Happy New Year and Merry Christmas!